GFI is Open-Sourcing Plant-Based Meat Innovation! Do you know one of the key reasons why the Impossible Burger made such a huge splash? Because no one realized that veggie burgers were ripe for innovation! And why is that? Because people have been making plant-based meats the same way for decades, and until recently, few people have thought of this market segment as a solution to urgent global problems. Clearly, that’s changed, and it’s time to take R&D in this field to the next level. 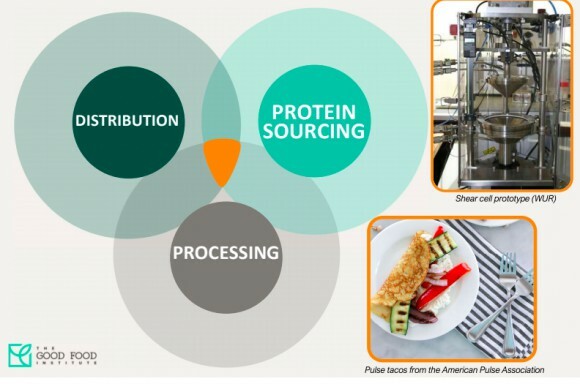 Today, The Good Food Institute’s SciTech team is doing just that by releasing the first-ever open-sourced guide to accelerate the success of the plant-based meat industry and direct entrepreneurs toward high-impact areas of innovation. This new guide includes a “mind map” that provides an overview of the entire plant-based meat industry as it currently stands and highlights areas that desperately need further R&D. In other words, if you’re interested in launching a food business that can replace factory farming, we have answers for how you can most effectively direct your efforts! Lead author Senior Scientist Christie Lagally will be presenting this guide to the GFIdeas entrepreneur group on Monday, Oct. 2., at 11 am EST. But we saved a few seats for newcomers! If you would like to join in on the fun, register here! There are a limited number of spaces, so the sooner the better. Bringing this information to light and encouraging much-needed innovation in the food system is why GFI exists. This is only one of many documents to come that will democratize information on how to end factory farming by using market forces and food innovation. Stay tuned! Check out the full guide here, and rest assured that we will be putting up a recording of Christie's presentation on our website's resource section posthaste.